Everyone will encounter an interview at some point in their life. Some may ace an interview some may not. But the biggest downfall anyone can commit is not being prepared for an interview. That is where things get a lot harder for someone who has an interview. Seems pretty scary right? Well, It is. 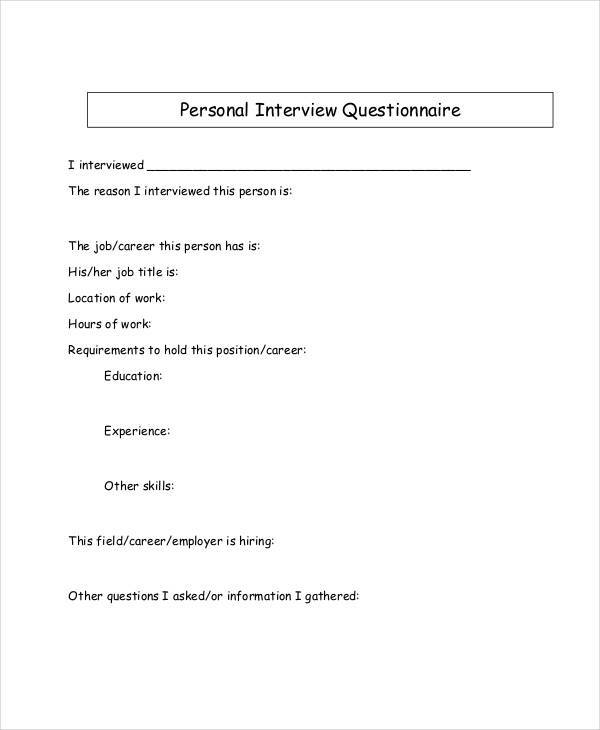 Luckily, this article provides you a wide variety of interview questionnaire examples in Word, PDF and other file formats that are very helpful for someone who has an interview or for the interviewer himself. 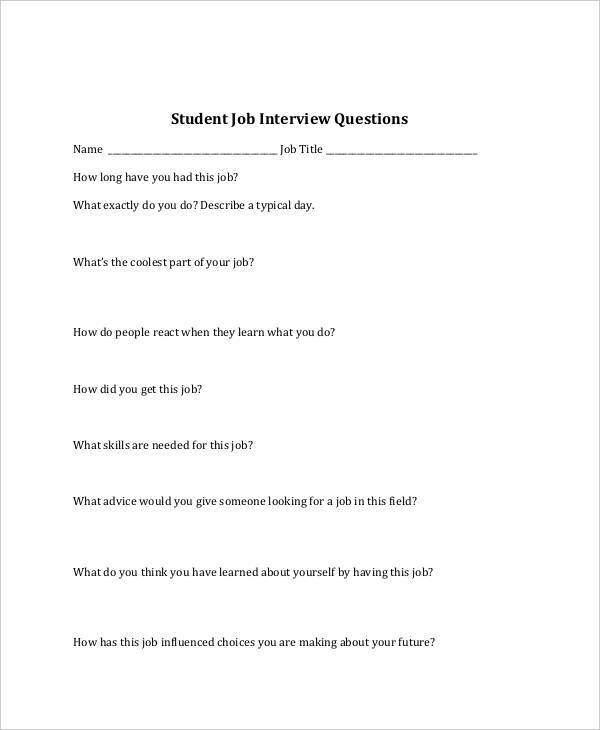 You can find in here the different kinds of interview questionnaire that you can use for any interview that you may encounter or conduct. 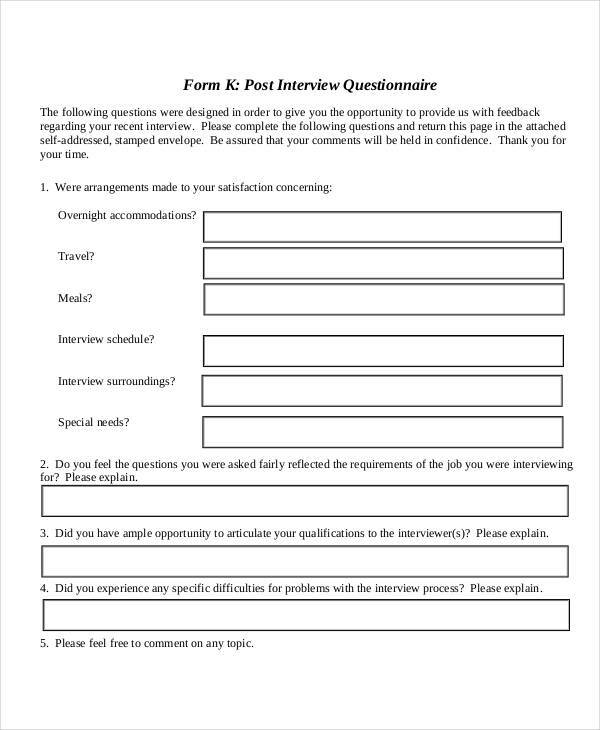 What Is an Interview Questionnaire? They are basically a list and/or guidelines of possible questions that a company may conduct to gather information before an interview that is done through face-to-face. 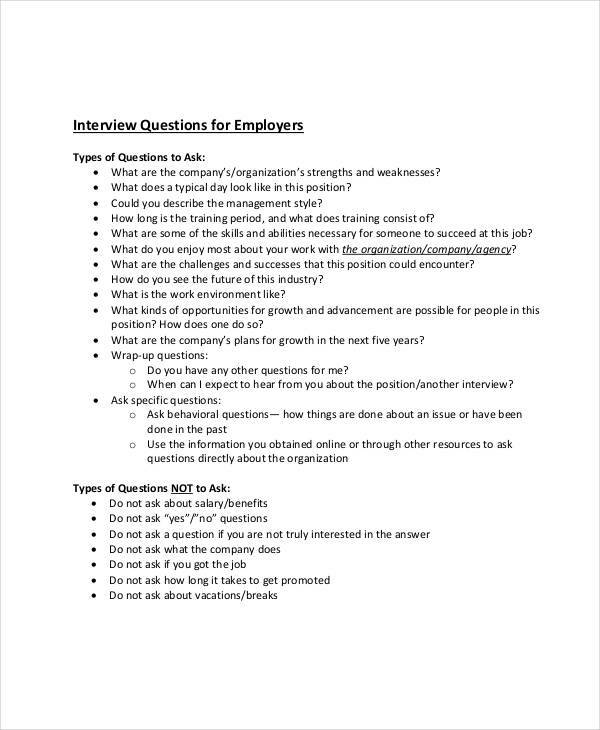 Although not all companies use the exact same list of questions, some of the questions they will ask may be quite similar to the questions in an interview questionnaire. 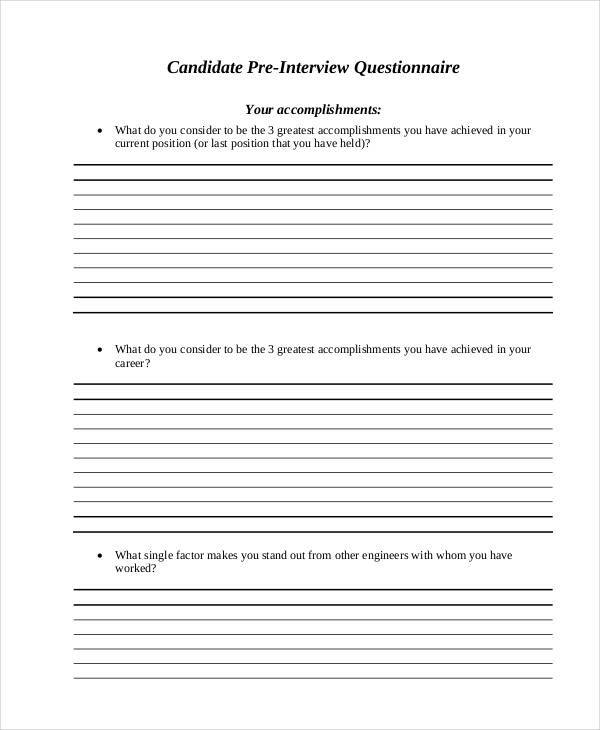 The interview questionnaire has been the basis of most companies in their actual interview. 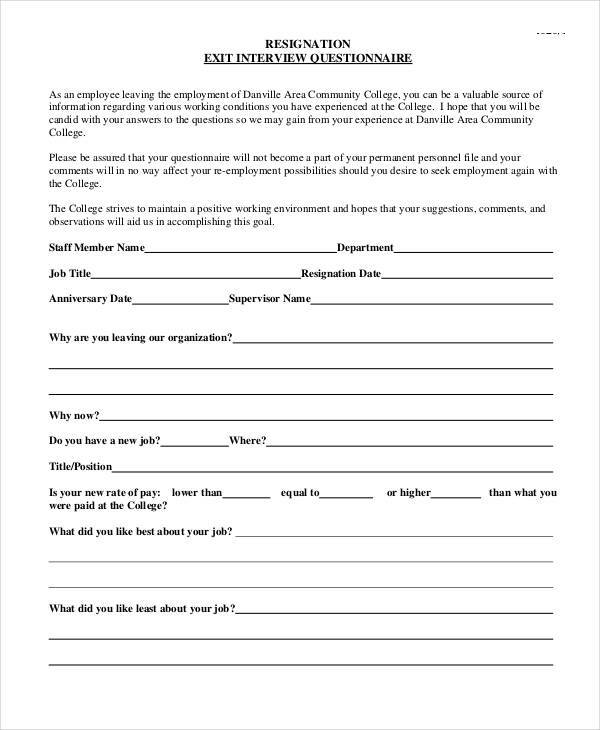 The initial information they will get from an evaluation questionnaire will be useful when hiring a potential applicant. 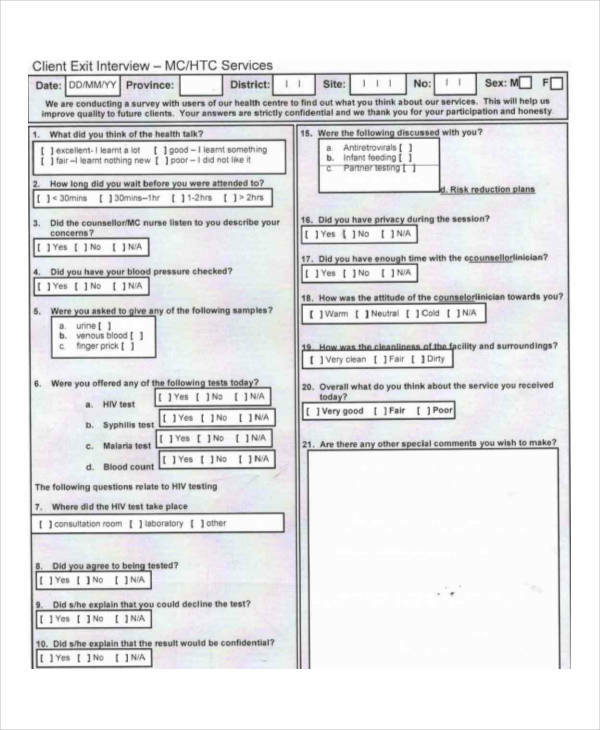 It is also used in the first screening test of most employer to find an applicant qualified for that position. What Are the Benefits of an Interview Questionnaire? As we all know, an interview is a process of questioning and answering. It’s where one person (interviewer) asks questions to another person (interviewee) who honestly answers that question. 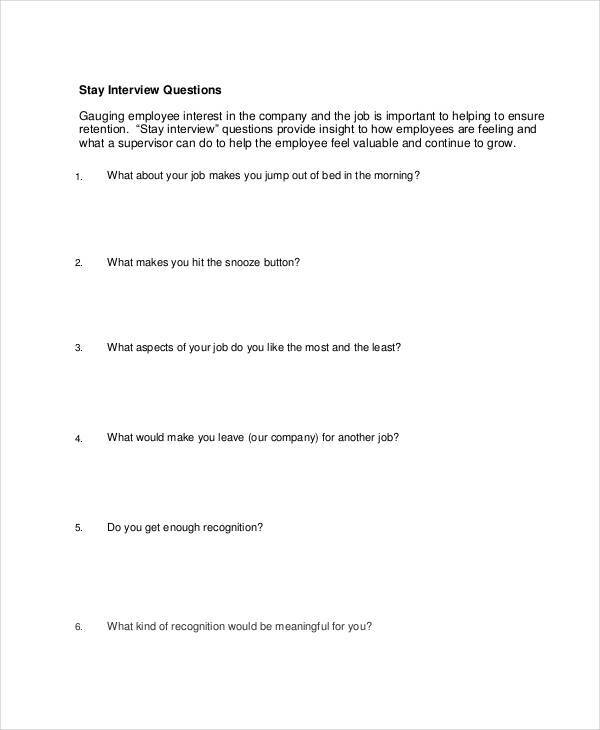 Now for that matter, the interview questionnaires are beneficial to both interviewer and interviewee. The information they will get from the interview questionnaire can be the basis of their interview. The interviewer may not dig deeper into his questions because the interview questionnaire has already given him the information he needs. The interview questionnaire has already laid out important questions to ask so that, it will not miss out important information. 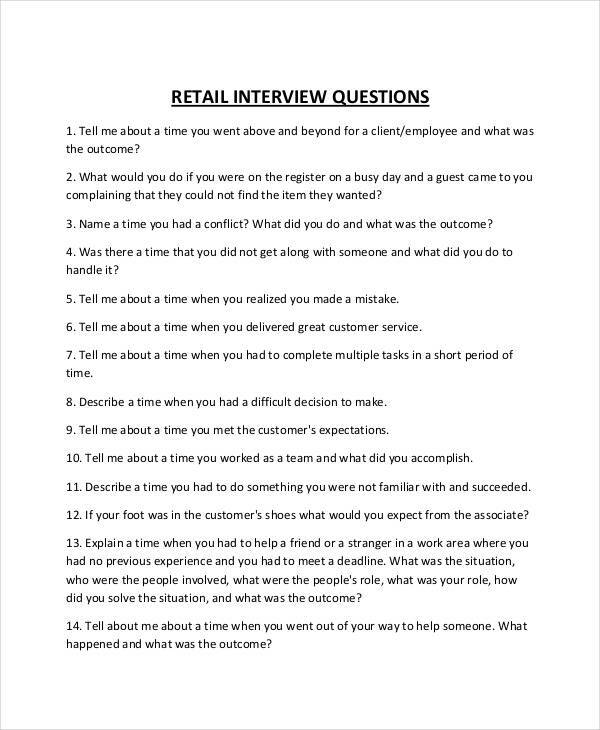 Interview questionnaire can save an interviewer a huge amount of time. 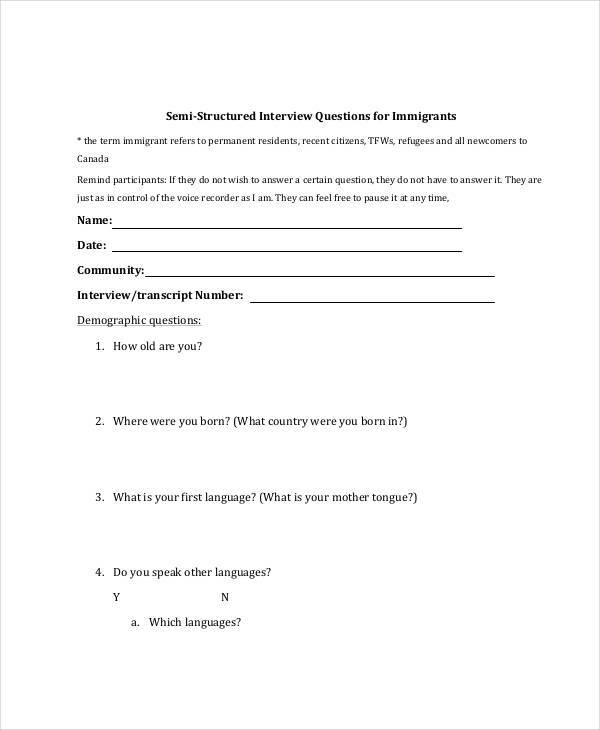 The interview questionnaire can be used as guidelines in an actual interview. 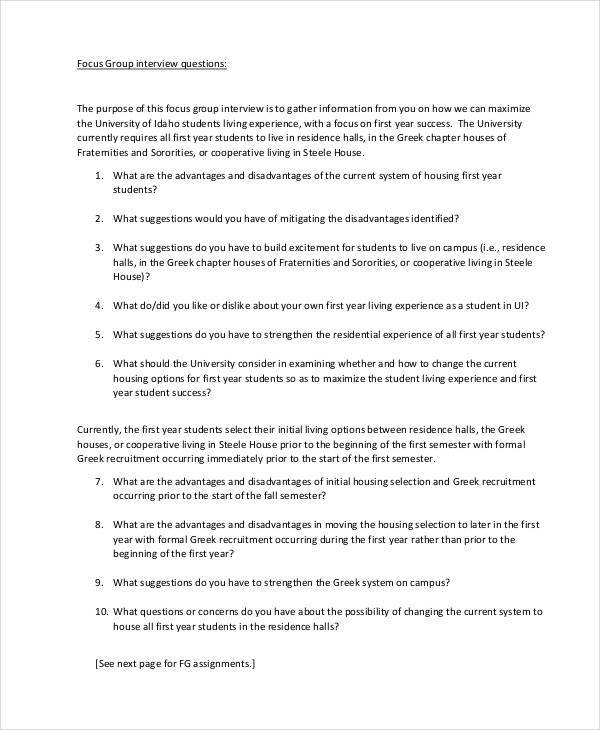 Using the interview questionnaire, the applicant will have a reference on what questions will be asked. 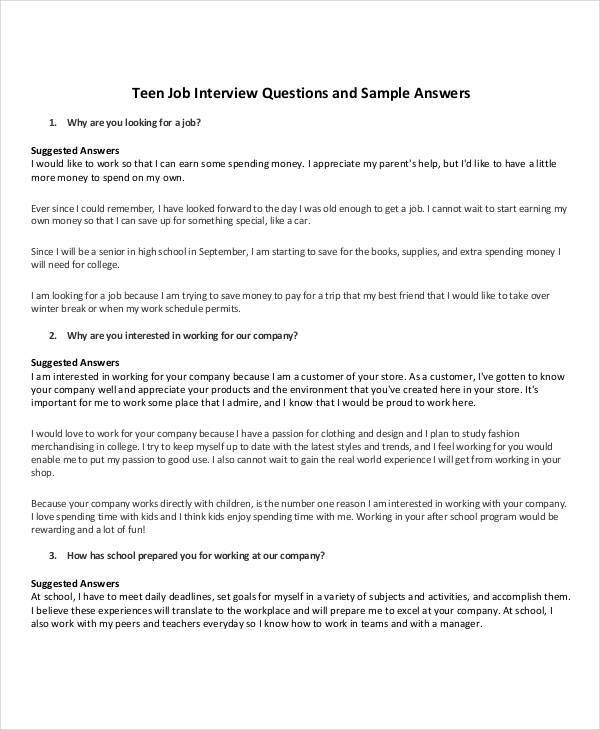 Using this interview questionnaire template, the applicant is now capable of mastering his/her answers in the actual interview. You see, using this interview questionnaire is beneficial to both of them. So if you are either one of them, download this interview questionnaire to help you out. Most companies today develop an interview questionnaire that will serve as a basis for the hiring decision. 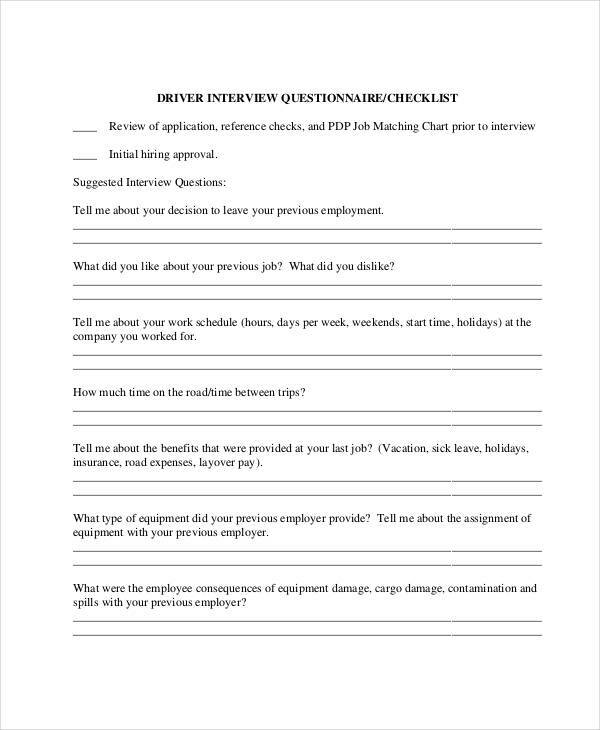 These questionnaires can also serve as an assessment questionnaire that can help employer picked the most qualified applicant in that particular position. 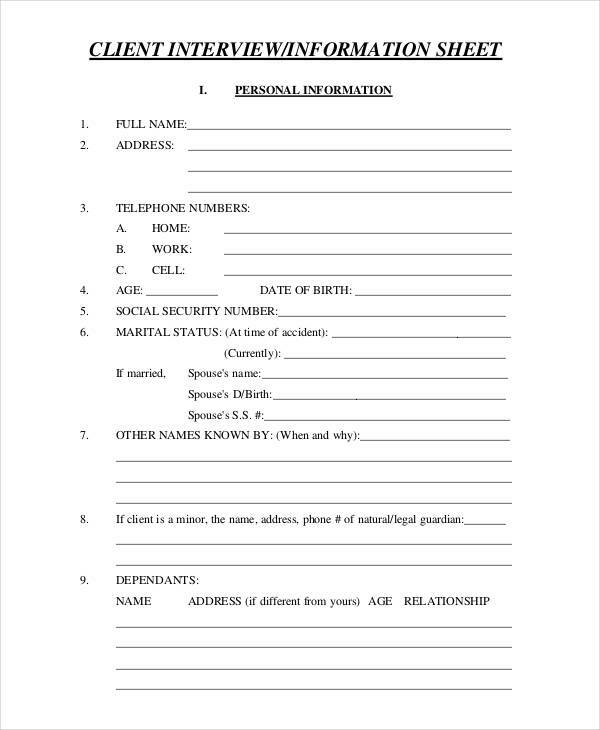 However, the actual interview is still present in the process and may be conducted before or after the applicant finishes answering an interview questionnaire. It is also important that the questions in an interview questionnaire will suffice the requirement for seeking a qualified applicant. In that matter, What types questions you write in the interview questionnaire will have a huge impact. 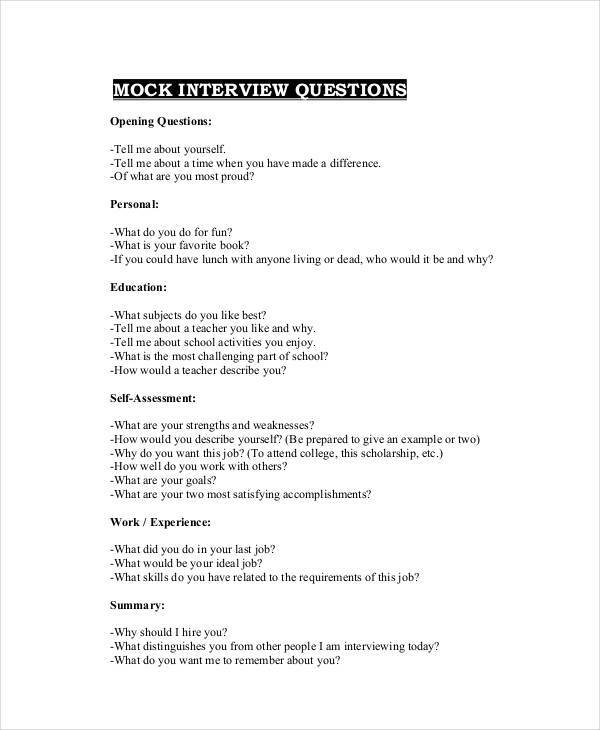 To assist you with that, here are few tips on writing an interview questionnaire. Determine and understand the position. Before you start on creating an interview questionnaire you must first need to know what is the position and what qualities should appropriate in that position. That way you can point out your questions and you will avoid misleading questions. Ask clear and open-ended questions. In the first place, you are not creating an inspection report. Try write questions that anybody can understand and write the questions that are designed to get an honest and meaningful question. Make your interview questionnaire long enough to get the important information. 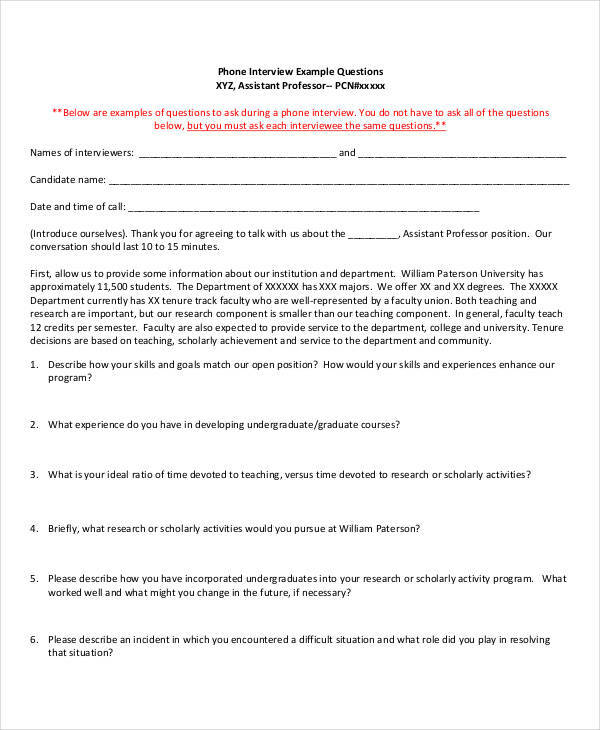 I’m not saying that you should ask as many questions as you wanted that may result in a number of pages questionnaire. Write only the questions that you think is important and relevant to the position. In that way, the applicant will not be exhausted in answering the questionnaire. And lastly, include a logical and/or descriptive kind of questions. 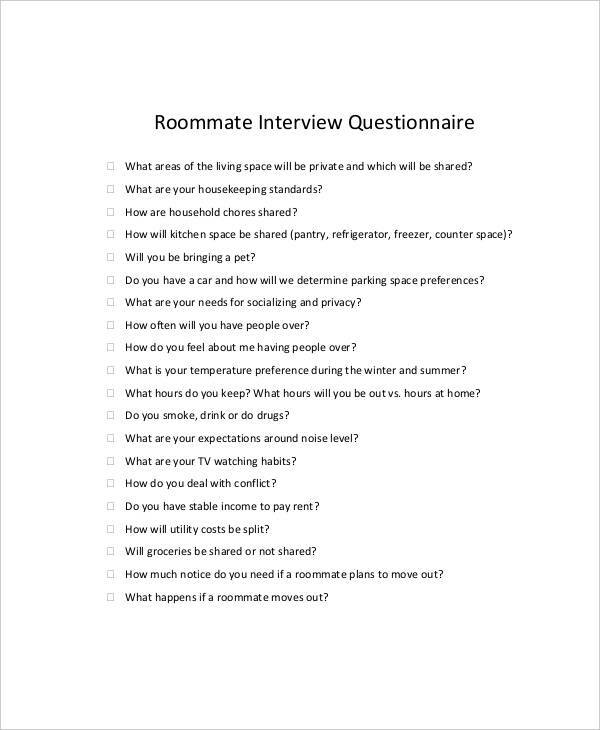 This types of questions are very important and necessary as this can narrow down your applicants. With these types of question, you can find applicants that are smart enough to do the job. 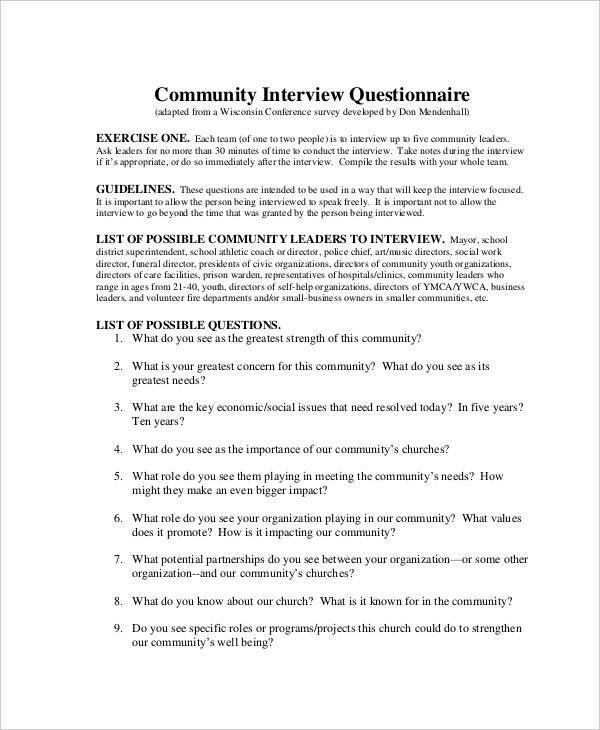 Interview questionnaire can be a great way to gather initial information from the one who is interviewed. So that when the actual interview comes, you already have lots of ideas to question and you will not bother to go deeper in your interview, giving you and the interviewee a pressure-free time. 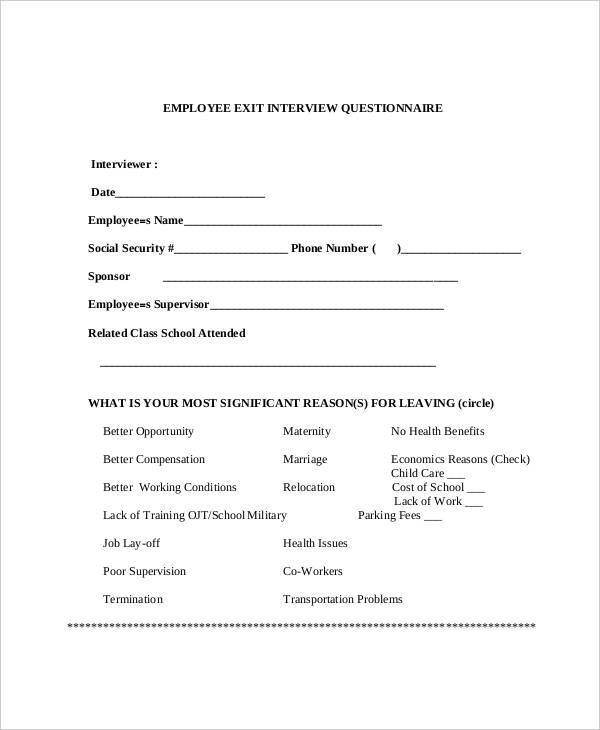 Exit Interview Questionnaire – This is used by the company if the employee will hand his resignation letter. They used this kind of questionnaire to know the reason why an employee will leave the company. The information they will gather can be used for the improvement of the company. Pre-Interview Questionnaire – This questionnaire is full of personality questionnaire that is used by the employer to get additional information about the applicant before the actual job interview. 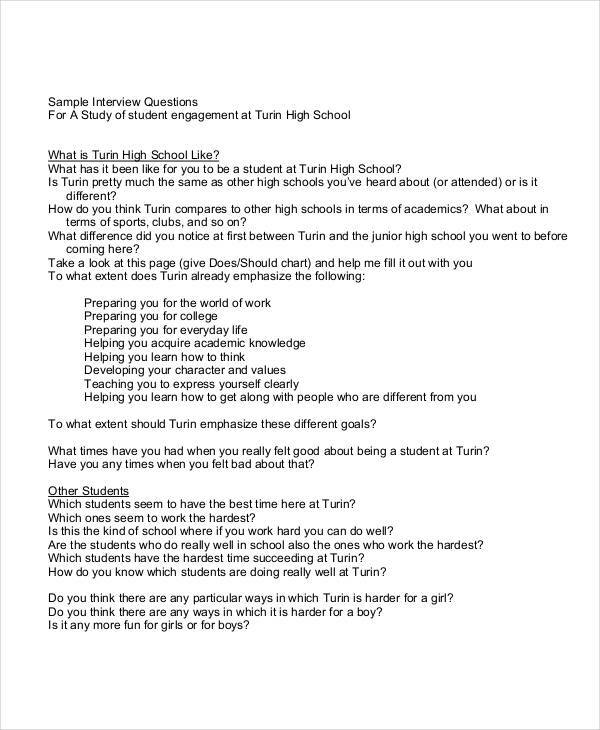 Student Interview Questionnaire – The student questionnaire is used for the students to gather information about the student’s job. This is also used to know what are the experience and what the student’s opinion and comments in that particular school. Client Interview Questionnaire – Client interview questionnaire are used to know what the client thought about the company’s service, and this questionnaire is also used to gather the basic information of a client. These interview questionnaires can really do a lot not just by providing you information beforehand, but by also giving you enough time to prepare. Always remember that it is not the interview questionnaire that can make a difference, it is how you handle the whole interview that matters.